First of all thank you for your interest in our courses. More importantly, thank you for your desire to increase you knowledge and skill as a SAFE and responsible gun owner. While this is a non-shooting course, it will satisfy Arizona DPS training requirements to obtain your permit. The course will cover defensive pistol selection, ethics of use of force, legal information, basic firearms knowledge, and what to do before, during, and after a defensive shooting incident, and legal information pertaining to use, carry, purchase, and ownership of a firearm. The chief instructor is an NRA certified Training Counselor, instructor, Professional gunsmith, and journeyman firearms engraver. He has over 3 years of professional firearms training experience, and currently certifies people to become NRA Instructors. 1) Reciprocity: several states recognize out CCW and will allow you to carry concealed in their states with our permit. Nevada is one of these states. I have spoken with DPS and they will not update their website until they get a written letter from Nevada, If you need to confirm, you can call 702-828-3271. 6) Serves as a way of informing a police officer you have a firearm without having to say the word “gun” when interacting with them. We will have someone on site to do fingerprints for $15. The CCW department of AZ DPS will not accept any clearance cards, including the DPS fingerprint cards. They will require new fingerprint cards to be filled out. Anyone with a desire to learn can attend this course. the information can apply to almost all ages. What are the requirements to obtain a CCW? Is twenty-one years of age or older or is at least nineteen years of age and provides evidence of current military service or proof of honorable discharge or general discharge under honorable conditions from the United States Armed Forces, United States Armed Forces Reserve or a State National Guard. not be convicted of a felony offense, unless the conviction has been expunged, set aside, vacated or pardoned, or the individuals right to possess firearms has be restored AND the individual must not be a prohibited possessor under state or federal law. complete a firearms safety training program pursuant to ARS §13-3112.N. CAN I SIGN MY FRIENDS/FAMILY UP? Absolutely! On the form below, there is an option to purchase multiple reservations. All you need to bring with you for the CCW class is a photo ID and something to write with. WHAT ARE THE BENEFITS TO HAVING A CCW IN A “CONSTITUTIONAL CARRY” STATE? ARE THERE ANY OTHER FEES ASSOCIATED WITH GETTING MY CCW? You will need to have your fingerprints done before submitting your packet to the state of Arizona. We do not require you to do them through us, but we will have someone offering fingerprinting services for $15 on site. It is important to know this is not included in the cost of the class. As with all other Arizona CCW classes, you will need to submit a $60 money order or cashiers check to AZ DPS within 90 days of the class along with your packet. I HAVE A DPS/FEDERAL CLEARANCE CARD, DO I STILL NEED TO HAVE MY FINGERPRINTS DONE? Yes. 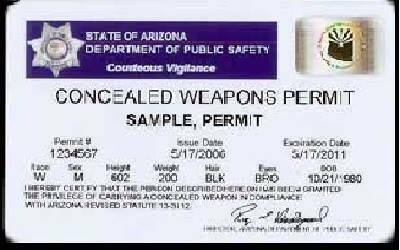 The CCW department of Arizona DPS does not recognize any clearance cards, even if they are federal. This is a non-shooting course, so no live ammunition or firearms should ever be brought into the facility. If you need to cancel, you may do so by calling our office at 480-244-6315 up to 48 hours before the course so we can provide a seat to the next person. If done before the cutoff date, you can credit the paid funds toward another class. All no call/no shows or cancellations within 48 hours of the class may result in all paid funds being forfeited. No Refunds will be provided. You will have the option to apply the amount you paid towards another course in the form of a credit if your cancelation or reschedule is arranged before 48 hours of the class.